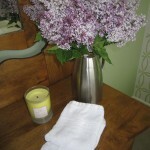 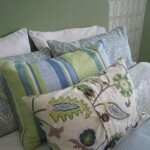 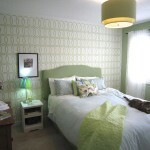 This room was transformed from a teenage boy’s bedroom into a serene and soft guest room. 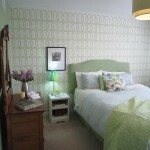 The feature wall was stenciled with a modern graphic pattern to add some pop and to highlight the upholstered headboard. 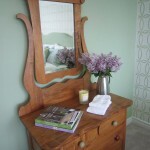 An antique dresser adds interest and it all makes this small guest room feel simply luxurious.